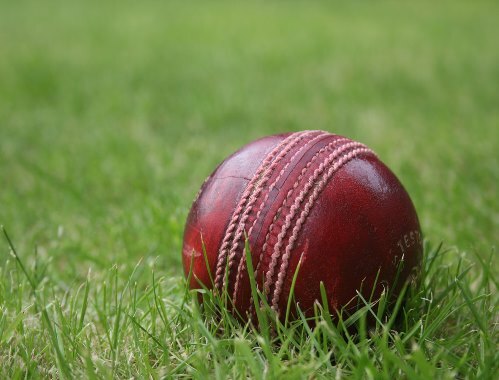 On the hard baked earth of the Victoria Ground, Uckfield were dismayed to lose the toss and be asked by Pevensey to bowl first on what must have been the hottest day of the season for a good few years, writes Tom Grimes. And although Chris Brady dismissed one of the opposition openers for just four, it quickly became apparent that their number three, the South African Zjac Pieterse, had the ability to make this a one sided contest. Almost anything straight or on the leg side went to the boundary, including an effortless flick for six through midwicket, with Pevensey reaching 60 well before the over count had reached double figures. However, with captain. McCallum rotating his bowlers well, and also necessarily in the heat, the introduction of Andrew Turner drew Pieterse (45) into driving a fraction too early and sent the ball straight to the waiting skipper at extra cover. From then on, it must be said that Pevensey failed to capitalise on their electric start, with their number four opting for a suicidal single by taking on Boniface at midwicket, who got the ball in quickly for a bizarre run out. The introduction of Dan Phillips brought two wickets and reduced the run rate with his excellent flight and a little turn, and Dave Tungate bowled excellently for two wickets of his own. Indeed it was a strong all round bowling performance, and a dedicated effort in the parched field, with Boniface adding catches to his run out and his own fine bowling. All this meant Uckfield bowled Pevensey out for just 130 off 35 of their 45 overs, an excellent result given the heat and the away side’s (seemingly) runaway start. At tea, where ‘After 8s’ and profiteroles caused a stir, alongside a tiny screen showing England’s own heroics in the football, Uckfield were very satisfied to be out of the heat and confident of a win. And although they lost the skipper early, Chris Moore played solidly against the sharp bowling of Pieterse for 46, and Tungate looked in good touch with a lovely straight six and set to win Uckfield the game when he was bowled by a quicker one from Pieterse for 36. Much of the hard work had been done by then and the lower middle order rallied to see Uckfield home, with Matt Reed’s 17 not out killing off the game and seeing Uckfield home by five wickets. A brilliant win played in a good atmosphere on a blistering day meant a cold beer was enjoyed by all at close, with satisfaction increased further by seeing Uckfield rising to second in Division 7 of the Sussex League.